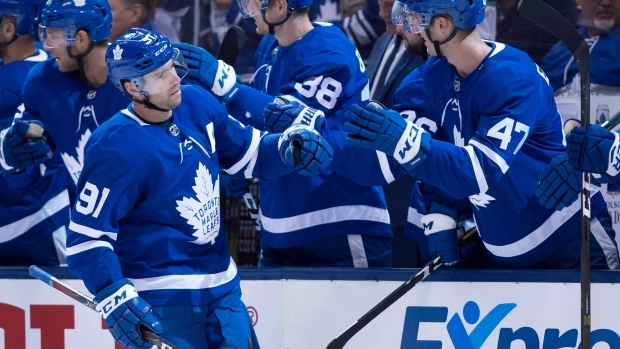 TORONTO – Deep into the dog days of training camp, the Maple Leafs are starting to see light at the end of the tunnel. With three preseason contests left on the schedule, Toronto is ready to roll out its projected opening-night lineup in two of them, including Wednesday night in Montreal. Seeing that group finally come together is a beacon for players who have grown weary of long practices and drill sessions, but also a reminder that the real work for the season ahead is just beginning. In preparation for the games that matter, head coach Mike Babcock separated Toronto’s shoo-ins from the rest of the players remaining in camp to get a look at how the structure of the team is coming together. At this point, Babcock says his main guys are “not close” to being ready for the actual games, but he's impressed by their continued intensity at practice. Time is quickly running out on William Nylander being in the lineup for the regular-season opener. The restricted free agent has missed all of Leafs' camp as negotiations continue on a contract extension. TSN Hockey Insider Bob McKenzie reported Monday that nothing is imminent between Nylander’s agent and Leafs' general manager Kyle Dubas, so the 22-year-old winger remains in Sweden training on his own. Babcock makes a habit of keeping in touch with all his young players throughout the summer, but said he hasn’t spoken to Nylander in recent months so as not to be seen as influencing the contract process. For their part, Nylander’s teammates remain supportive of him handling his business while taking care of their own each day at the rink. Matthews has played with Nylander on his wing for most of the last two seasons, developing a bond that stretches on and off the ice. With the contract dispute dragging on, Matthews has checked in with Nylander only sporadically to avoid putting any more pressure on the situation. Over the last two weeks, Nylander’s absence has forced open the door for bubble players to make their mark in camp, the same way his eventual return will force tough decisions for Babcock on who plays where. So far Tyler Ennis has cultivated strong chemistry on the Matthews’ line with Patrick Marleau, while Josh Leivo is having a solid camp skating with Nazem Kadri and Connor Brown. The question now is how the burgeoning chemistry in that lineup carries over against NHL-calibre competition.